Small domestic-type Reverse Osmosis (RO) units feed a single, dedicated tap in your kitchen. The way they work is they slowly fill up a small tank which is an integral part of the RO unit and usually sits next to the RO filter under your sink or nearby. Every time you draw water from the tank, for example by having a glass of water, the RO slowly replaces the same amount of water back into the tank. You won’t notice how slow the RO filtering process is unless you completely empty the tank in one go - which at a tank capacity of 9 Litres plus is unlikely. Large RO's don’t have their own tank but will typically work by feeding water into your existing header tank, usually operating "on demand" with an "on/off" relay switch. 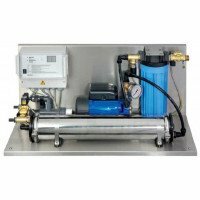 These RO's will give you perfectly filtered water but they need looking after. Unlike smaller domestic models they are not “fit and forget”. For example the filters need monitoring and changing every few months. You need to watch the pressure and generally keep an eye on them. It’s a bit like looking after a car - well, at least in the old days - where you needed to keep an eye on your oil and water levels etc. This might be why in a domestic setting it is typically wealthier people who would have a large whole of house RO system. It's not so much the capital outlay but because they usually have people working for them who take care of the ongoing maintenance. In a factory or business this need to monitor / maintain is easy. For a member of staff it is not usually at all onerous. it just needs to be done regularly. 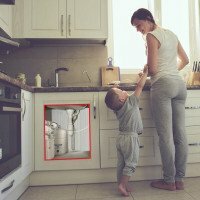 If you want a large RO whole of house filter and you don’t have the staff, and don’t want the hassle of doing it yourself, you need to ask yourself whether you really need it There is probably a better solution for you. Feel free to contact us to discuss your requirements. Another consideration for residential uses is that the pumps on these larger RO units are noisy. You’d normally situate the unit in its own room / utility room. So you need a suitably sized property. They are also a bit of a palaver to install - but admittedly that’s the plumber's problem. On that point: fitting one of our large RO’s is not a complex job for a competent qualified plumber. But you might need to install a header tank if you don’t already have one. Be careful: a side effect of RO is that it turns water more acidic. Besides a possible negative health effect of drinking acidic water over the long term, it is highly likely to act on copper pipes and dissolve copper into your water - which can turn your hair blue! There are remedies to this but you need to be aware of this if you want to use the RO water for bathing. 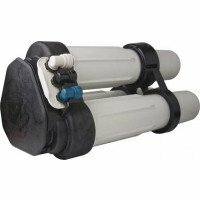 In hard water areas a water softener is required before the RO to protect the membrane from scaling. You can opt for either a “Simplex” softener with a quality switch or a “Duplex” type. The latter is slightly more expensive but has the advantage that it has two tanks so the softened water is “always available”. With a simplex type you have to stop the RO while the softener regenerates. (Regeneration only happens every few days usually in the dead of night, for about 30 minutes, so it's unlikely to be a factor. However, do you want to risk the expensive membrane being damaged by taking in non-softened water? So best practice is to get a Duplex softener. Using water softeners will result in excess sodium in your drinking water: However you don’t need to worry about it because the RO will filter the sodium out. Note. As part of the RO process approx 70% of the water entering the system will be rejected as “waste water”. (The exact amount depends on your local water quality). If you are on a water meter this can add to your costs. The bigger the header tank the better as large RO’s take some time to start up ie when first switched on the RO pressure has to build up. Think of it like a light switch. You don’t want to keep turning it on/off. You want to keep the RO pump working at the sweet band of pressure. Turning it off / on every half hour or so is OK.
To solve this you want a header tank that gives you from 2 to 6 hours worth of water ie to get a good “buffer”. You simply need to establish your preferred water output. This is usually a relatively simple calculation of what you will need to draw from your header tank vs the rate its needs replenishing by your RO while leaving a "buffer" of enough water in the tank. We have off the shelf solutions for the two most common larger RO sizes - see below. But we can handle any size RO system you may require. Simply contact us to discuss your requirements.